Buying that huge bulk tub of ice cream to keep up with the increasing demands of growing children is a purchasing habit of many families - as is splurging occasionally on a small tub of premium ice cream. WIth the fancy packaging, smaller tubs, gourmet names and a higher price tag, most would assume they're getting ice cream that's significantly better quality than the family-sized tubs. Why isn't my husband, and all the dads, on the class email list? CHOICE has now put this assumption to the test, to work out if all premium ice cream is worth the extra we're paying for it and the findings are very interesting - two of the cheapest ice creams tested were in the top three. An expert panel participated in a blind taste test where each were given unlabelled vanilla ice cream in random order. CHOICE says that, "Experts independently judged all ice creams, scoring each sample for flavour and aroma, texture and presentation." Three popular brands came up trumps, with experts scoring 81 per cent for all three. Two of them are also the cheapest. 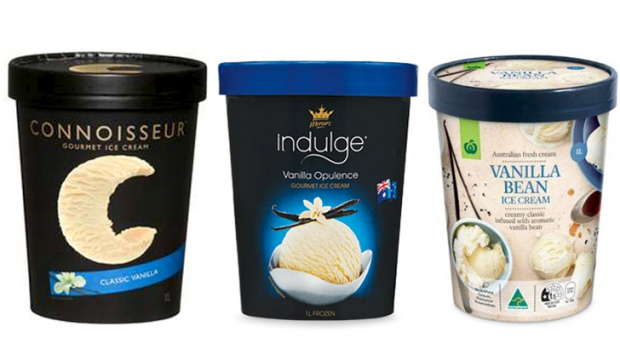 Connoisseur Classic Vanilla, Monarc (Aldi) Indulge Vanilla Opulence and Woolworths Vanilla Bean all claimed first place, however the difference in price is considerable. Connoisseur comes in at a comparatively expensive $1 per 100 mls, while the Aldi brand is just 45 cents per 100ml. Woolworths Vanilla bean is slightly more expensive at 47 cents. It's great news all round for both your taste buds and your wallet. Take a look at CHOICE's interactive below so you can see how the rest of the pack scored in terms of taste, nutrition, and cost. Two of the most expensive ice creams were scored very much in the middle of the pack. See the full report on the CHOICE website.